If you just moved into a new home, if you are looking to redecorate your house, or even if you simply are looking for anything for the house you’ll find it with Directly Home, online at DirectlyHome.com. Directly Home offers some of the most chic, comfortable, and fabulous furniture for basically every room in the house. Find a huge selection of furniture for the bedroom, living room, dining room, kitchen, kids room, bar and game room, and the home office. Also find fabulous selection of elegant and decorative home accents. All this and much more for your cozy home at Directly Home. 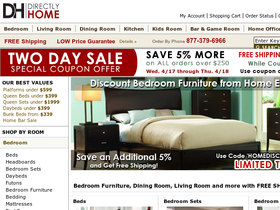 Remember, RetailSteal.com offers the best Directly Home coupons, Directly Home discounts, and Directly Home promotions. All orders placed with Directly Home are shipped via ground carriers to the 48 contiguous states. Costs vary depending on the order and the destination. See website for full details, exclusions may apply. Head on over to Directly Home for free shipping on all orders. Click link to shop. Save 10% on lighting and get free shipping with coupon code. Save 7% on a minimum purchase of $700 with coupon code when shopping online. Save 5% on all orders by using coupon code when shopping online. Save $25 off on orders of $200 or more with coupon code when shopping online.